I purchased this gorgeous display cabinet a few years ago from a lovely lady whose husband had made it. Originally it was this dark timber, but had a gold striped wallpaper in the back. I replaced the backing with old sheet music. Later on I decided to remove the sheet music and paint it all green, with a white background. I later distressed the edges so the original dark stain came through, but the idea of adding chicken wire to the glass was always in the back of my mind. Then I stumbled upon this gorgeous cabinet at Stone Gable last week and knew this was the effect I wanted. See how similar it is in shape and totally swoon worthy. So here was the first attempt. Not very pretty. I began sanding back most the cabinet to raw wood, then figured I didn't really need to do that and it would be easier to just paint it white again and use a brown paint to distress the edges. Only I went a bit overboard with the brown paint. On the second attempt I added a bit more white paint over the brown. It was nice, but still a bit too much brown. And finally, third time lucky! 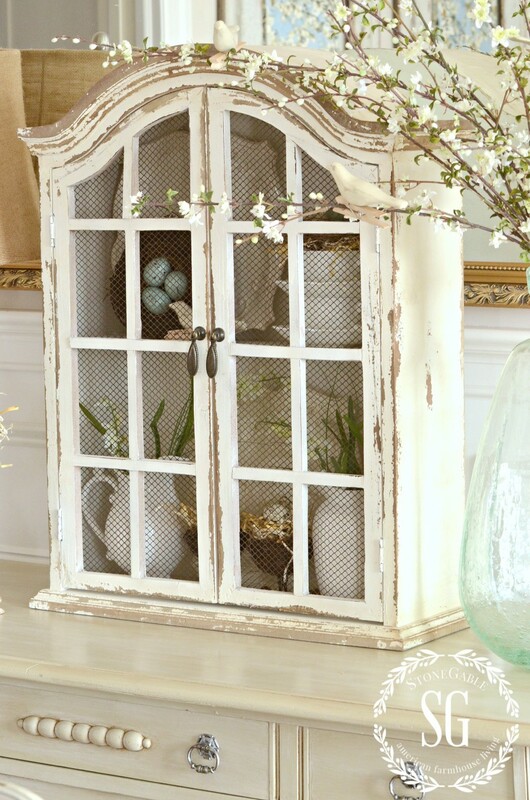 A used more white paint to fill in most of the cabinet, leaving only a bit of brown on the edges and details. I also added some chicken wire behind the glass inserts. I'm really happy with the way it finally turned out. Have you ever had one of those projects that just doesn't go the way you want it to, but you get there in the end? Lots of trial and error Julie but so worth it. This cabinet came out so pretty. Thanks Kris. Looking back it was great originally. Oh well. Your piece looks great and it was worth the effort I think! I am re-painting a dresser that I didn't like how the first color turned out so I know what you mean! It's just beautiful! It's looked really good with all it's different looks but I especially like this look! Julie, I think every single time you changed it, it looked beautiful! Thanks so much for sharing it at the Vintage Inspiration Party! It looks beautiful!! Love the added chicken wire too! Love what you have done with you cabinet! And I totally get anything over at StoneGable as inspiration!!! You did a habulous job. Enjoy!!! Your final version was worth all the work! It looks great. So very pretty, Julie! I love all of the different looks, but especially the final one! Thanks so much for sharing with us at the Talented Tuesdays Link Party! Shabbilicious Friday Link Party and Features!